SLM V2 is a comprehensive set of interconnected application modules that cover the entire Process Safety and Functional Safety LIfecycle. 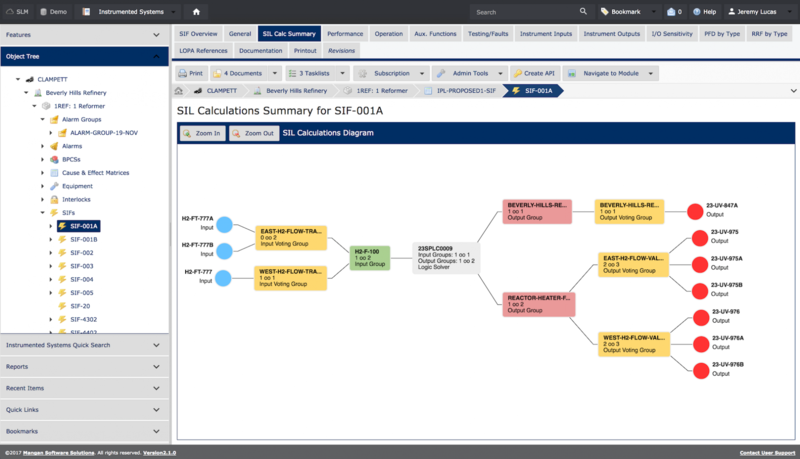 From HAZOP and LOPA Studies to SIS Design, Operations and Maintenance, SLM V2 has all the tools you need to successfully manage the Safety Lifecycle. SLM V2 has software modules for risk assessment and management methodologies like HAZOP, LOPA, and BowTie. As well as Instrumented, Non-Instrumented, and Relief Systems for IPL management and SIS design and SIL verification. To ensure that the designed systems are managed and performance is measured, SLM V2 has an Operate & Maintain, Functional Safety Assessment, MOC, Action Item Tracker, And Personnel Modules to manage the operation and validation of your safety systems and personnel. All of this inside one Enterprise Ready Software Platform to help you manage the Safety Lifecycle. Secure Cloud deployment and delivery or On-Premise virtual server instances. Designed for user and geographic cloud scaling for multi-site distributed deployments. User configurable dashboards for each application module giving users the ability to put what’s important to them up front. Modern “Flat” user interface leveraging the latest UI/UX technologies from Telerik, GoJs, and AMCharts. 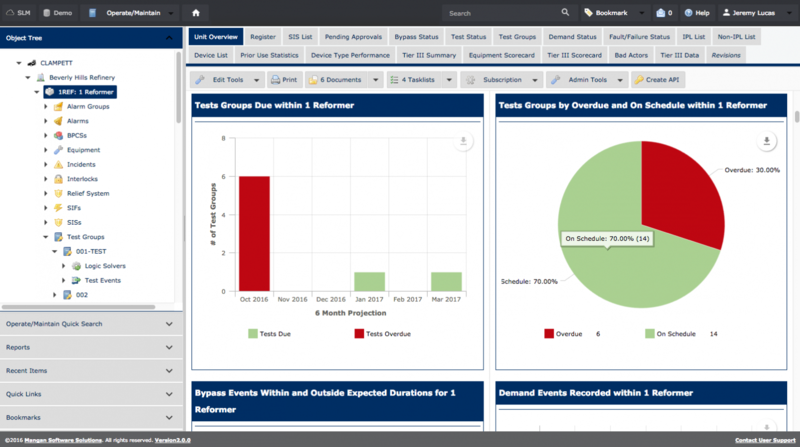 Dynamic report filtering, grouping and sorting allowing for deep data inspection in data tables, charts and graphs. Export any data object or report to Excel or PDF, to allow for additional manipulation, discussion, dissemination, presentation, and review. The SLM Software Suite is comprised of 10 Software modules that encompass the entire IEC 61511/ISA4 Safety Lifecycle. Click on a module below for more details.  The Atlas™ SLM Platform Modules are included as a part of the base system and are used by all of the Software Modules to provide Global Data, Document, Personnel and Configuration Management. Our all new HAZOP in SLM v2 has been designed to replace the legacy PHA/HAZOP software tools of the past. 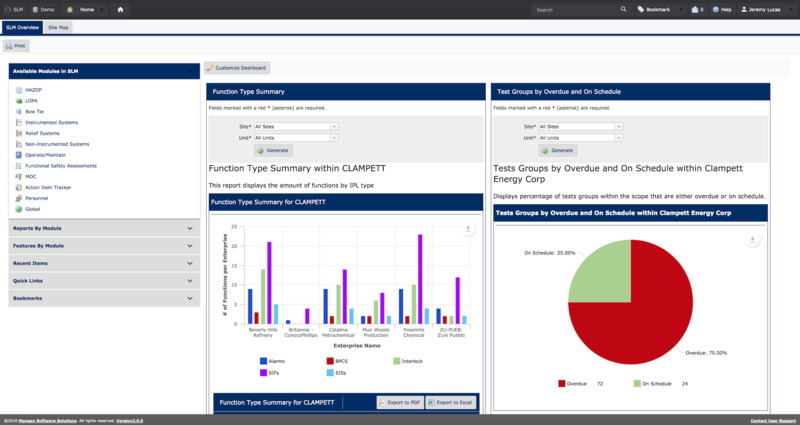 This dynamic software tool not not only offers an all new HAZOP Quick Workflow™ to accelerate HAZOP studies and quickly view and enter HAZOP data, but gives organizations the ability to standardize their PHA processes and methodologies. Instant reports and KPI's reduce the cost of third-party experts, and the underlying data allows SMEs the ability to assess and fine tune how the organization executes risk management. (New) HAZOP Quick Workflow™ that allows you to quickly work through a HAZOP Study linking equipment, nodes, deviations, and scenarios in a real-time collaborative way. (New) HAZOP Template Report that lists the all HAZOP, Nodes, Deviations, and Scenarios in one complete output to review, email, print, and share with your team or across the organization. (New) HAZOP Recommendations Report that shows all recommendations from a HAZOP in a simple filterable display to help identify the areas of highest priority for resolution and further study. (New) Critical Equipment List Report that quickly identifies which equipment is critical to the safety of your plant and how that equipment is covered. (New) Generate Action Items for further analysis or study by the HAZOP team directly from HAZOP/LOPA Recommendations your 1-click away from assigning a task and tracking it to closure. (Enhancement) Create HAZOP’s directly from the plant hierarchy at the unit level to quickly start your HAZOP Studies and drive operational awareness. Designed to be the successor to legacy PHA/HAZOP software tools, the HAZOP Module not only offers an intuitive Human-Machine Interface (UI) to accelerate HAZOP studies and quickly view HAZOP data, but gives organizations the ability to standardize their processes. Instant reports reduce the cost of 3rd party experts, and the underlying data allows SMEs the ability to study how the organization executes risk management. The following Data and Reports are part of the SLM V2 core HAZOP Module. (New) LOPA Recommendations can be automatically added to the Action Item Tracker to ensure all recommendations are mitigated and addressed in a timely manner. (New) Critical Instrument List was added to the LOPA module to provide a list of “equipment at risk” identified during a LOPA Study along with the highest risk in each of the equipment's associated LOPA Sheets. (Enhanced) LOPA Template Report that identifies all LOPA worksheets contained in the LOPA Study, in alphabetical order. 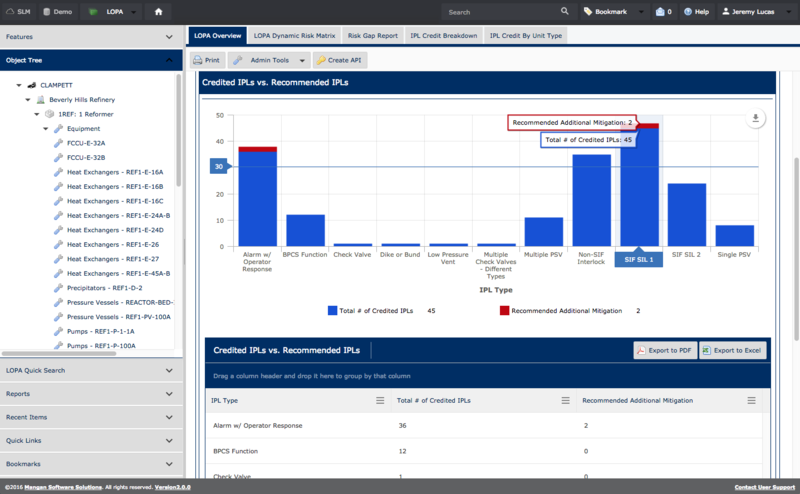 (Enhanced ) LOPA Recommendations Report that lists all LOPA recommendations in a user filterable display and provides direct links so the user can open up a LOPA recommendation Registry View and modify or work with the recommendations of the LOPA. (Enhanced) IPL Register Report now supports Drag and Drop functionality for sorting and grouping and Export of IPL Register data as well as visibility at the Enterprise, Site and Unit Levels. (Enhancement) Guided workflow messages to help users import and work with HAZOP data in the LOPA module. (Enhancement) Default LOPA Worksheet has been reorganized and designed to increase readability and printing allowing for a simplified page flow. (Enhancement) LOPA Worksheet Consequence Severity dropdown selections now display the severity value with its descriptions to aid in easily selecting the consequence severity. (Enhancement) LOPA Studies submitted for approval, now include the associated LOPA worksheets as part of the approval. The LOPA Module provides intuitive worksheets to standardize your LOPA process and conduct IPL Assessments. 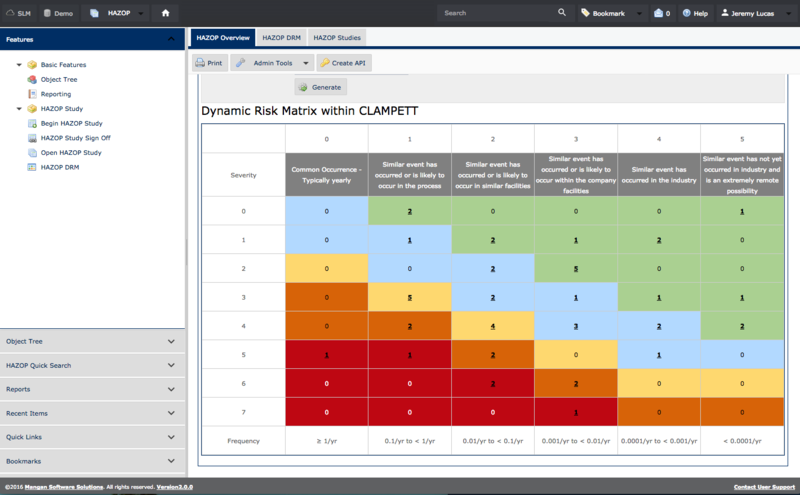 The Dynamic Risk Matrix is configurable and offers real-time risk monitoring and identification. Instant reports and KPIs reveal unmitigated risks to allow IPL gap closure scheduling and progress. These reports offer unprecedented review of risk mitigation strategies. 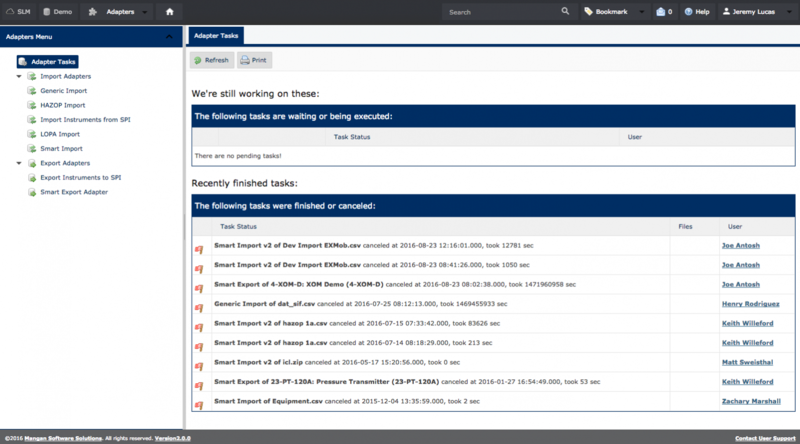 Conduct LOPAs with built in LOPA worksheets using scenarios readily available a click away in the HAZOP module. Intuitive interface and automatic calculation of Pass/Fail status based on required Risk Reduction Factor (RRF) simplifies LOPAs. Asset synchronization from defined IPLs makes instrumented and non-instrumented systems available in other modules. LOPA data can even be imported from other industry tools. Automatically populate your IPL Registers and complete IPL Assessments with easy, user-friendly Tasklist functionality. The following Data and Reports are part of the SLM V2 core LOPA Module. 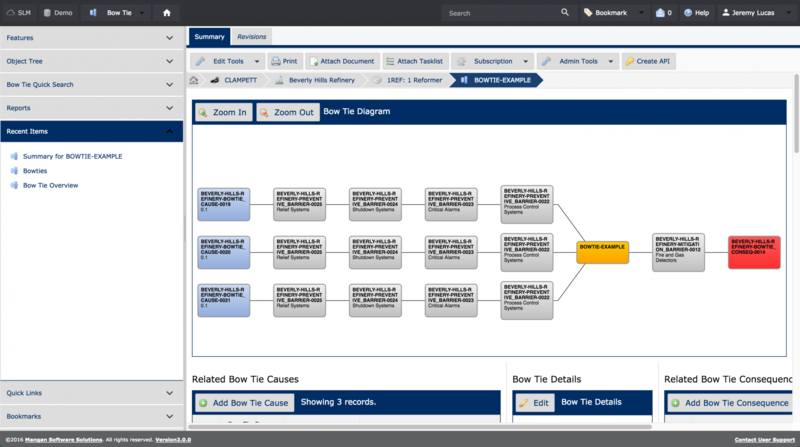 (New) Automatically Create Bow Ties using existing LOPA studies with an all new LOPA import workflow that guides the user through the import and linking process. (New) Approve Bow Tie assessments using our standard Approval Workflow to ensure Bow Ties of record are easily managed and tracked. (New) Bow Tie Analysis Assessment checklist and workflow ensures each area of investigation has been identified, and conformance to barrier assessment protocols have been met. (Enhancement) Link Bow Tie assessment data throughout the system allowing free flow of data or inclusion of Bow Tie reference data as part of an overall enterprise safety plan. (Enhancement) Add unlimited threats, hazards,mitigations and consequences to your Bow Tie Assessments ensuring that all areas of assessment are covered. (Enhancement) Export Bow Tie data Via PDF or Excel to share in external communications, presentations, or risk assessment meetings. The Bow Tie Module incorporates your existing hazard analysis data to facilitate Risk Analysis and Risk Assessments on your mitigation and prevention barriers. Bow Tie analysis is becoming increasingly common at communicating important risk mitigation measures for a wide range of facilities. Integration with the evergreen data in the LOPA Module ensures analysis is using the most up-to-date information at your organization’s fingertips. Bow Ties provide a visual and interactive experience; allowing users to identify preventive and mitigating barriers. 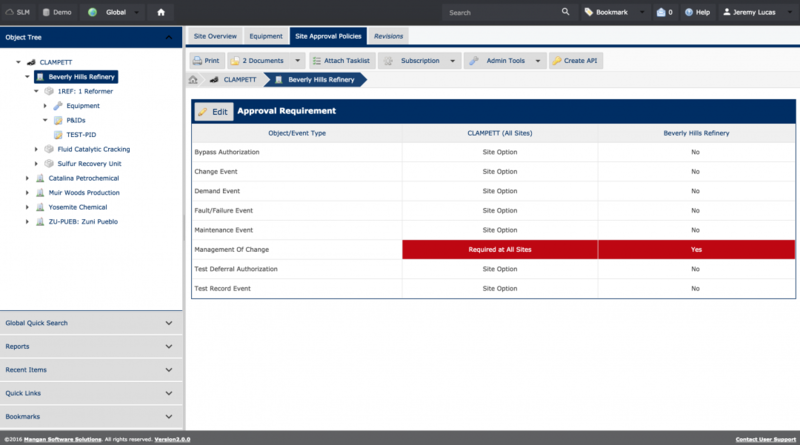 With the barrier assurance workflow, users have a complete picture of all barrier levels to determine the total risk of a hazardous event within the plant. Execute the Bow Tie methodology using your existing HAZOP and LOPA data to conduct Risk Analysis and Risk Assessments on your mitigation and prevention barriers. 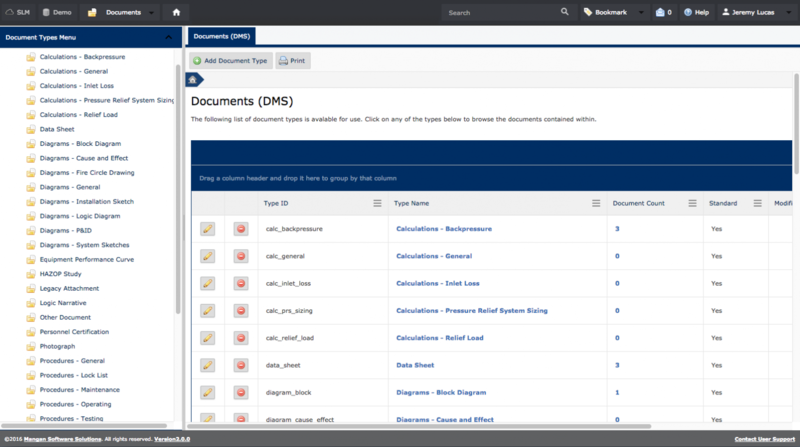 As a single source for all safety lifecycle data, SLM incorporates data from other modules to use in the Bow Tie Module. Avoid from-scratch analysis by using the most up-to-date information at your fingertips. The following Data and Reports are part of the SLM V2 core BowTie Barrier Assurance Module. The Instrumented Systems Module documents safety critical instruments and associated voting structures; culminating in evergreen Safety Requirement Specifications (SRS) with Cause & Effect Matrices available on-demand. (New) SIL Calc functionality is fully implemented in SLM v2. Our SIL Calc engine utilizes Boolean algebra to determine PFDs at each AND/OR gate by calculating non-repetitive combinations of failing elements/groups. (New) Generic SIF Template Report and Generic SIF Creation from Report Calculation. (Enhancement) I/O Sensitivity with Total RRF, and Sensitivity Interval charts for Inputs and Outputs. Identify, document and manage instrumented IPLs and their assets and equipment. A Safety Requirements Specification (SRS) can be a complex document. The SRS defines requirements for many topics and requires a significant number of supporting documents. The module comes standard with a SIS and SIF SRS templates that incorporate ISA/ANSI 84.00.01 requirements and industry best practices. Users can define voting logic, and input/output structure of instrumented systems. Users can automatically create cause and effect matrices for all safety related functions. Systems are available automatically and immediately in the Operate/Maintain/Integrity Module to begin logging events. The following Data and Reports are part of the SLM V2 core Instrumented Systems Module. The Non-Instrumented Systems Module captures, organizes and automatically generates reports on IPLs and safeguards not captured in the Instrumented Systems and Relief Systems Modules. The module comes configured with generic data sheets for common safety systems, to include: pressure regulators, mechanical stops and check valves. Flexibility built into the software allows you to create custom safety systems and data sheets using your organization’s standards and procedures. Record testing and maintenance activity and upload documents for any non-instrumented safety system or device. The following Data and Reports are part of the SLM V2 core Non-Instrumented Systems Module. The Relief Systems Module is the data management solution that provides a comprehensive approach to the management of pressure relief systems. The module is globally accessible, allowing for plant or enterprise-wide standardization of relief systems data. Our system comes equipped with data sheet templates; reducing confusion on what data needs to be tracked. Track your relief systems through the entire lifecycle from initial identification and design through testing, maintenance and decommissioning. 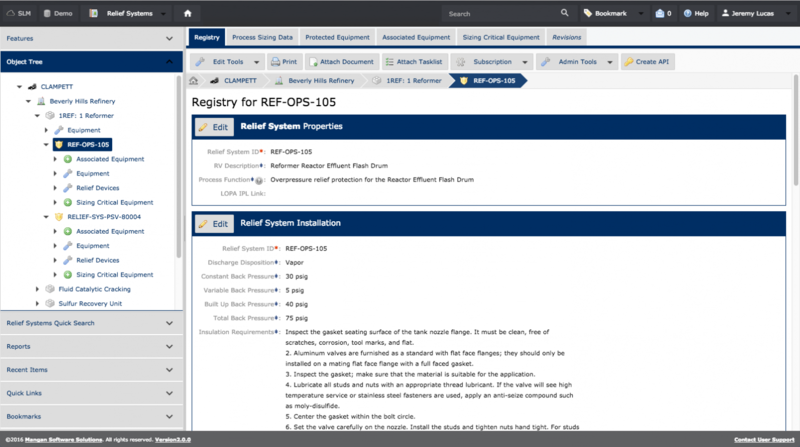 The Relief System Modules allows you to manage engineering data for all safety relief systems and their associated equipment. Within this module, you are able to use Tasklists for Relief System engineering checks, generate Relief System and equipment registers, produce Relief Systems data sheets, or sync IPLs identified in LOPA. Since SLM is an interdependent software system, it is always easy to reference other data in the system (HAZOP, LOPA, etc.). The following Data and Reports are part of the SLM V2 core Relief Systems Module. (New) Functional Safety Plan, located at the site level in the FSA Module. The “Functional Safety Plan” template shows a complete Functional Safety Plan overview, and safety organogram detailing the hierarchy of functional safety roles and responsibilities within a sites functional safety plan. The Plan breaks down the Functional Safety Lifecycle Phases and shows a task list of items that should be completed as part of a Functional Safety Plan. 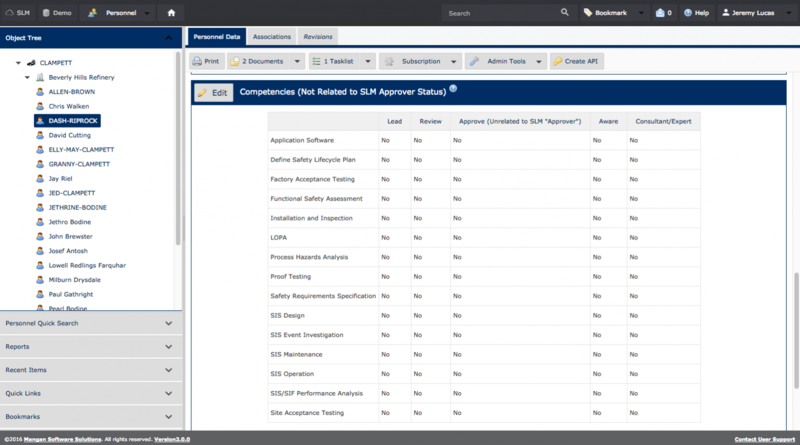 The SLM Functional Safety Assessment module allows you to readily complete a Stage 1 through Stage 5 FSA in a standardized format – ensuring consistency throughout your organization. 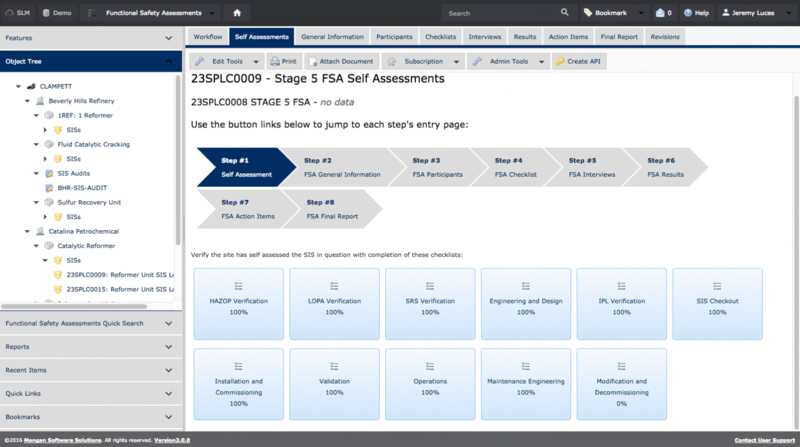 This tool allows you to define requirements for an FSA and then use the application to improve the effectiveness and efficiency of execution. The integration of all Safety Life Cycle data provided by SLM also allows for effective integration of FSA data with other critical data such as HAZOP and LOPA studies, Safety Requirements Specifications and SIS performance. Report SLM provides a framework means of standardizing the inputs and results of FSAs, and allows an organization to leverage FSAs for tangible improvements in SIS design and operation. Using Report’ FSA Module for the execution and documentation of FSAs expedites the process and ensures consistency in assessing the functional and systematic requirements of your SIS. The following Data and Reports are part of the SLM V2 core Functional Safety Assessments Module. (New) API-RP-754 Tier III Metrics are implemented as a way of tracking challenges to safety systems, such as measures to log large consequence events. (New) Main Dashboard presents a widget based selection of KPIs/Reports displayed as window panes that default to the user’s account role. (New) Approval Workflow for Event feature allows Personnel objects associated with a user account to approve or reject events through a series of steps. (Enhancement) View Tabs for Enterprise, Site, & Unit view tabs and reorder are now implemented to allow for a more streamlined visualization for the user. (New) Device Service Status Report lists all devices within the scope that meet the Service Status criteria. (New) Function Service Status Report lists all functions within the scope that meet the Service Status criteria. (New) Devices Missing Model or Service Data Report identifies all devices that are missing a Model Number, Serial Number or a Service Category designated. (New) Devices not using a Generic Model Report identifies all devices that don’t have a Generic Model designated. (New) Devices without Test Groups Report identifies all devices that are not associated with any Test Group. (New) Functions without Test Groups Report report lists all functions that are not associated with any Test Group. (New) Functions without Devices Report lists all functions that don’t have at least one device associated with each Input or Output Asset. (New) Device Event Summary Report This report provides a list of all device events occurring within the specified report parameters with links to navigate to each event. (New) IPL List Report is a replication of the Site and Unit IPL List Views, but formatted for use as a reference document that can be used for Operating Manuals or be used by Enterprise Personnel. (New) Periodic Performance Report is intended to provide Site or Enterprise Management with summary of the Events that have occurred over a period of time, typically monthly, quarterly or annually. (New) Reports are now presented by Category to allow grouping and simplification of the 60+ report listing. The reporting categories are: General, Operational, Testing and Administration. (New) Event List Views and Device List Views have linked fields that represent quantities of Events that meet the field’s search criteria. This feature represents View Reports that are displayed when these linked numerical values are clicked. (New) Pending Approval view summarize all the Pending Events at the Enterprise, Site and Unit levels. (New) Bypass Summary/Status view lists Operate-Maintain Bypass Event and Performance data. (New) Testing views that allow the user to access Operate/Maintain Test Event and Performance data at Site and Unit level. (New) Failure Summary Status views that summarize all the Failure Events and their status at Enterprise, Site and Unit level. (Enhanced) Function Event Summary views that summarize all the Function Events at Enterprise, Site and Unit level. 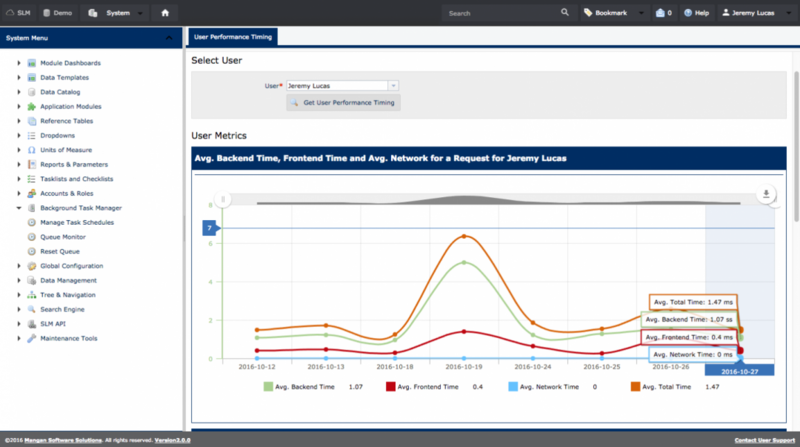 (Enhanced) Demand Event Views are associated with Demands upon IPL Functions. The contents of each view vary by the data that is appropriate to the Overview Level. (New) Generic Models views are associated with Generic Models and Prior Use Statistics for Generic Models. The contents of each view vary by the data that is appropriate to the Overview Level. (New) Device Type Performance views are views associated with Device Type Performance data. These Views collect the quantities and in-service performance for each Input or Output Device in use in the Enterprise, Site or Unit. (New) Automatic Statistic Updates this feature allows SLM to periodically update data fields related to Testing and Performance within the Sites and Units of an Enterprise. (Enhanced) Device List View to provides basic data of the Devices within the Unit. (Enhanced) Failure Report displays the list of failure rates by Device Type and Generic Model based on Prior Use Operations and Maintenance data. (Enhanced) Event Status Change functionality allows user to change the “Event Status” of an event from approved or finalized back to created. This change can only be performed by authorized personnel. (Enhanced) Service Status Change Event will change the “Service Status” of functions or devices to be commissioned, out of order, decommissioned, replaced, replaced-in-kind, or demolished. This “Service Status” affects installed, service, and prior use hours. (Enhanced) Bypass Authorization manages permission for a bypass to take place and records the details of the execution and return to normal operation during the bypass. (Enhanced) Test Event Workflows allow Functions and Devices to be tested independently from each other. (New) Test Deferral Authorization event which manages permission for a test to be deferred. This module is designed to capture the in-service performance of Safety Related Functions and Safety Related Devices within a processing facility, and report on the history and status of these entities. Data captured over time allows managers to identify performance trends and address problems and performance. System users can easily define Test Procedures at the unit level and begin recording test data immediately. The Operate Maintain module uses device event data to generate proven-in-use data and subsequent reliability statics. 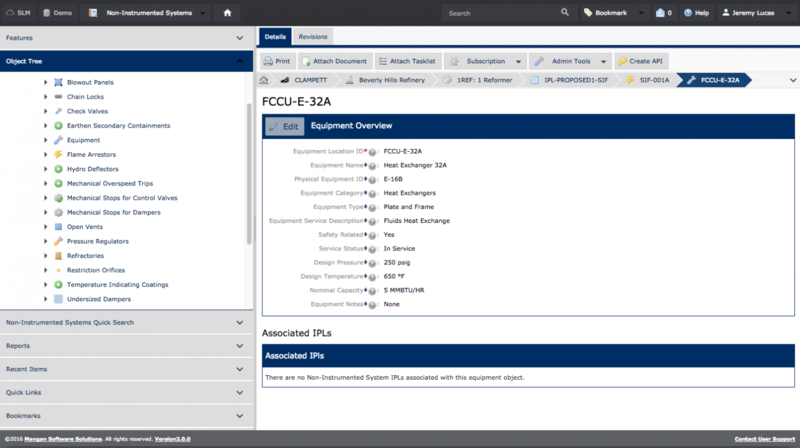 The Operate/Maintain Module within Protected SLM captures the in-service performance of Safety Related Functions and Safety Related Devices within a processing facility; and reports on the history and status of these entities. The module records events and proof test results in order to conduct in-depth failure analysis and execute test planning. The following Data and Reports are part of the SLM V2 core Operate and Maintain Module. 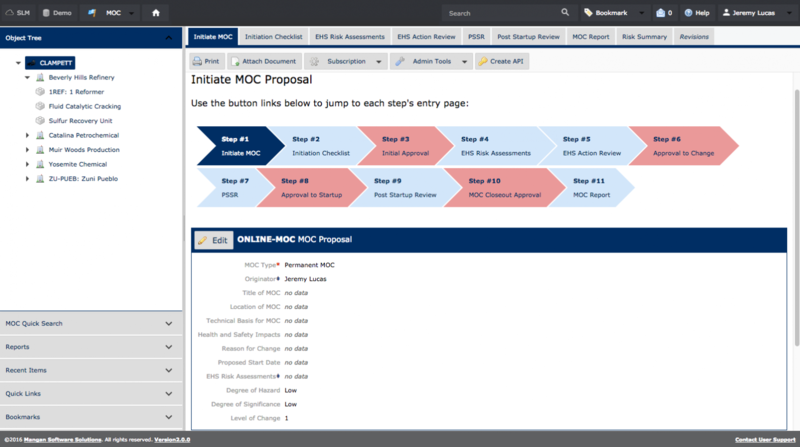 (Enhancement) MOC Workflow has been updated to streamline the MOC process and satisfy major requirements, such as welcome page, user dashboard reports, workflow graphic, MOC action items and MOC final report. (Enhancement) MOC Associated Object Linking now adds the capability of showing associated HAZOP Nodes and LOPA Analysis per MOC object. MOC creates a standardized 10-step approach for your Change Management process. The software workflows provide tools which facilitate the evaluation and control of design modification, operation, technology, facilities, equipment or procedures. Progress through your MOC with the required checklists, assessments, reviews and approval processes – all generated within MOC. Quick links to Process Safety Information within the other modules accelerates the MOC process and ensures accurate analysis of potential hazards. As with all of the modules, the flexible SLM platform makes customization fast and inexpensive. The ProSys SLM MOC Module provides a central location for performing and tracking MOCs anywhere in the enterprise; from a sweeping change to a small change involving a process unit at a specific site. Module workflows and checklists guide personnel from initiation through start-up and MOC closeout. Increase collaboration and data sharing by allowing everyone involved in the MOC process access to the system. Quick links to Process Safety Information within the other modules accelerates the MOC process and ensures accurate analysis of potential hazards. The following Data and Reports are part of the SLM V2 core Management of Change Module. (Enhanced) Action Item Tracker Views and Reports. 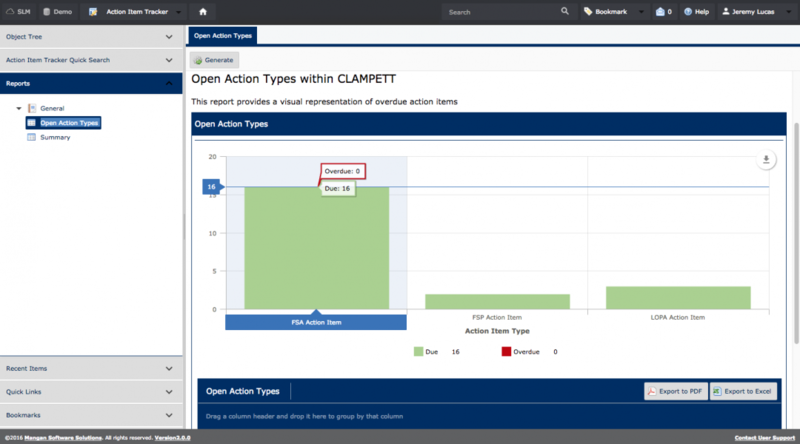 Views per object are added at the Enterprise, Site, Unit, level: Open Action Items, Closed Action Items. At the Site level: Open Action Items, Closed Action Items. At the Unit level: Open Action Items, Closed Action Items ad At Personnel level: Stand Alone Action Items. (Enhancement) Stand Alone Action Item Enhancement allows users to create stand-alone action items and utilize the built-in notification system to assign these items to other users. The Action Item Tracker Module is a centralized location where users can create and access assigned action item information from all modules for follow-up and reporting. Data relating to the action item is linked across modules and readily available for reference purposes. Custom reports and KPIs are available with a click of the mouse. The Action Item Tracker Module is a centralized area where users can access assigned action item information pulled from all modules for action or reporting. Data relating to the action item is linked across modules and readily available for reference purposes. Customized reports and KPIs are available with a click of the mouse. The following Data and Reports are part of the SLM V2 core Action Item Tracker Module. The SLM V2 Atlas™ Platform is the core set of software and technology used to configure, manage data, and site hierarchy across the complete enterprise. Everything from custom UI logo’s, font styling, units of measure, language translation, usage metrics, and API interfaces. To data objects, how they are defined, what they contain, and how they are displayed in the system. These things can all be configured and managed using our software platform. We have designed our platform to be extensible so that all your data can be stored and managed within our common set of frameworks, as well as extending the platform to suit your enterprise requirements. Puts the user in control of what information is important. Configure with up to 3 Columns of Dashboard Widgets. Manage Equipment Globally across the System. Manage Personnel who are part of HAZOP, LOPA, MOC, FSA Studies but may not be an SLM Application user. SLM Import Adapters let you define and store Import Templates for standard csv data import files. Adapters are also available for common data import formats, as well as a data mapping tool to allow users to map data fields to object fields from an import file. (New) LOPA Object importer allows for importing the default PHA-Pro LOPA database format and fields. (Enhancement) Detailed Instructions on how to use the Import Adapters and the Smart Export Adapter. (Enhancement) Improvements to import default PHA-Pro HAZOP database. The HAZOP Specialty Importer has been improved to be capable of importing the default PHA-Pro HAZOP Database format. The SLM Configuration Module is the heart of the Enterprise Application Configuration. Everything from Module Layout, Hierarchy, Data Objects, Associated Reference Tables and Drop Down Lists to Reports and Reporting Parameters are configurable in the System Configuration Module. SLM V2 has a flexible Licensing model allowing you to shape your Safety Lifecycle Solution around your business needs or project goals. We have also built a number of product bundles which group common modules together for specific safety lifecycle management disciplines. Please speak with one of our solutions analysts to help you determine the best fit for your plant or enterprise needs. “BP’s Prior Use vision was to meet compliance at an enterprise level with ANSI/ISA-84 &IEC 16511 and internal standards, and automate the data gathering and calculations to meet these requirements. What our Customers are Saving..
16M Cost Savings in First Year! Regulations and audit findings in the SIS arena have become more stringent with recent safety incidents, but legacy facilities and antiquated systems make compliance complex and time consuming. Disparate systems and home grown databases create user push back to adoption of consistent process safety data and procedures. Time consuming data collection combined with non-existent reporting capability hinder informed safety oversight on every level. Developed from the ground up with strategic operators after a real-world incident, ProSys encapsulates best practice processes and workflow for the SIS lifecycle, including: HAZOP, LOPA, SRS and FSA. ProSys is designed for enterprise wide systematic documentation, auditing and compliance while offering turnkey integration capabilities for prior data formats. ProSys’ enhanced data gathering efficiency’s create significant upfront savings while enabling management to mitigate risk through collective knowledge and transparency. Contact us today for a one-on-one demonstration of our award winning safety lifecycle platform.